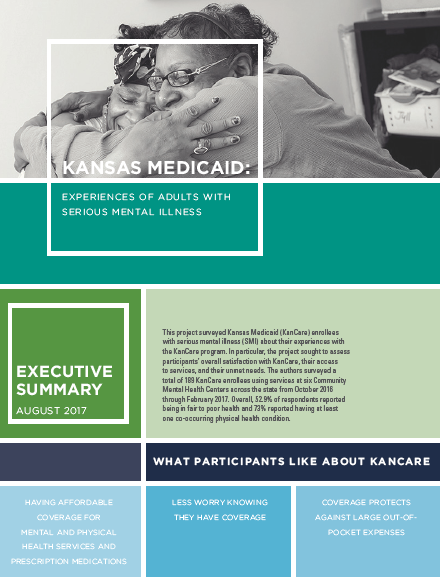 This project surveyed Kansas Medicaid (KanCare) enrollees with serious mental illness (SMI) about their experiences with the KanCare program. In particular, the project sought to assess participants’ overall satisfaction with KanCare, their access to services, and their unmet needs. The authors surveyed a total of 189 KanCare enrollees using services at six community mental health centers across the state from October 2016 through February 2017. Overall, 52.9% of respondents reported being in fair to poor health and 73% reported having at least one co-occurring physical health condition.